I am lucky. 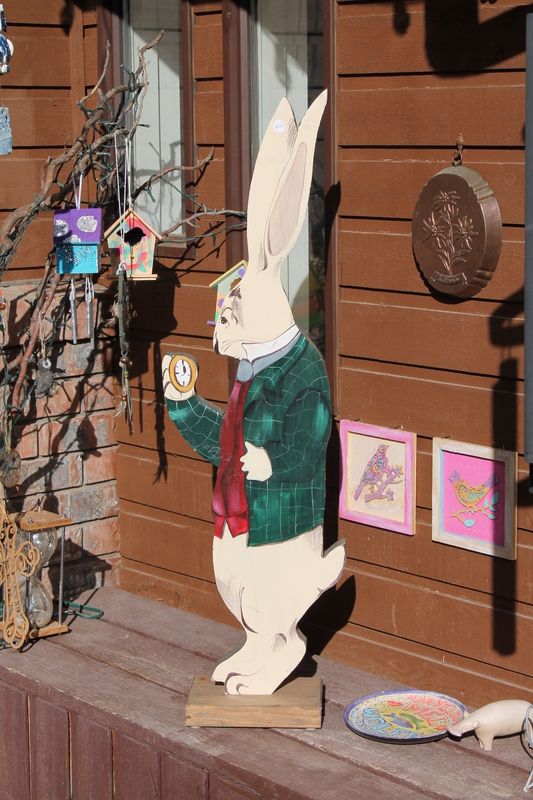 We only have one flea market in town, very few real antique stores and only about 5 used/second-hand stores. I frequent them all on a regular basis. I love the concept of recycle/upcycle/world doesn’t need another toaster. Today was a good day at the flea market. The vendors are such a cast of characters. I love them all. 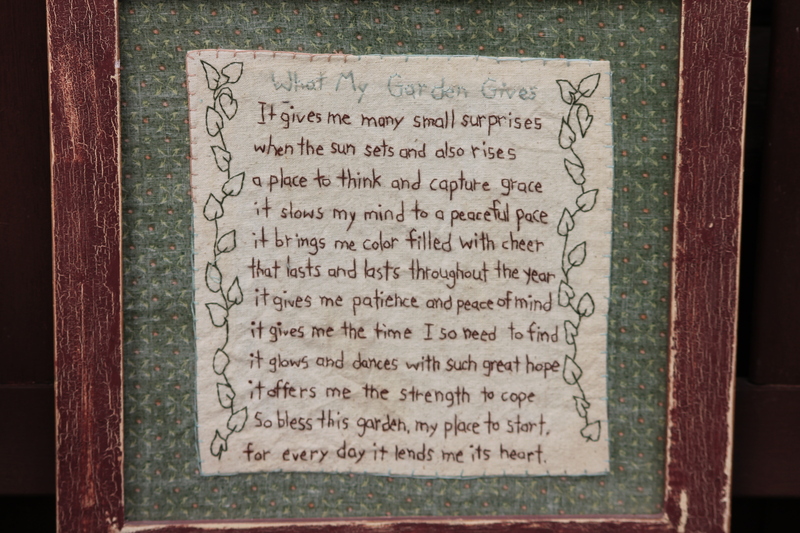 Look at this beautiful vintage hand embroidered piece, nicely framed and read the sentiments around the garden, perfect for me. What a beautiful meditation. 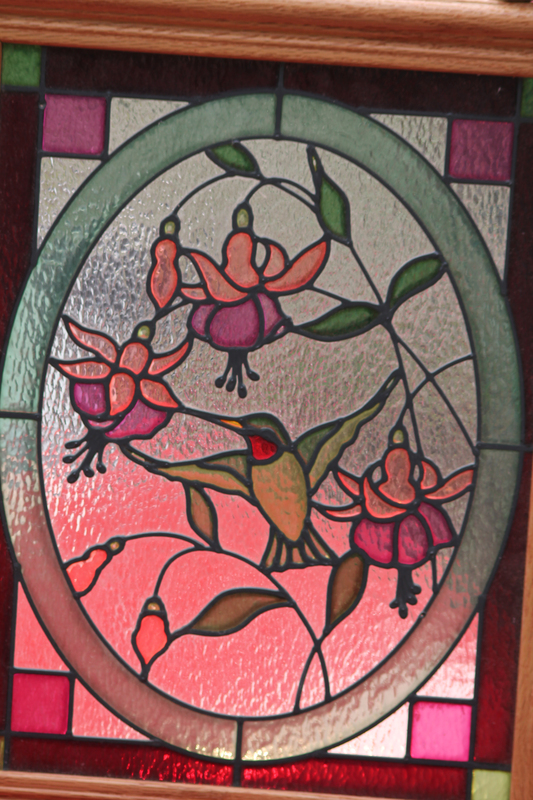 Next a stained glass framed hummingbird. 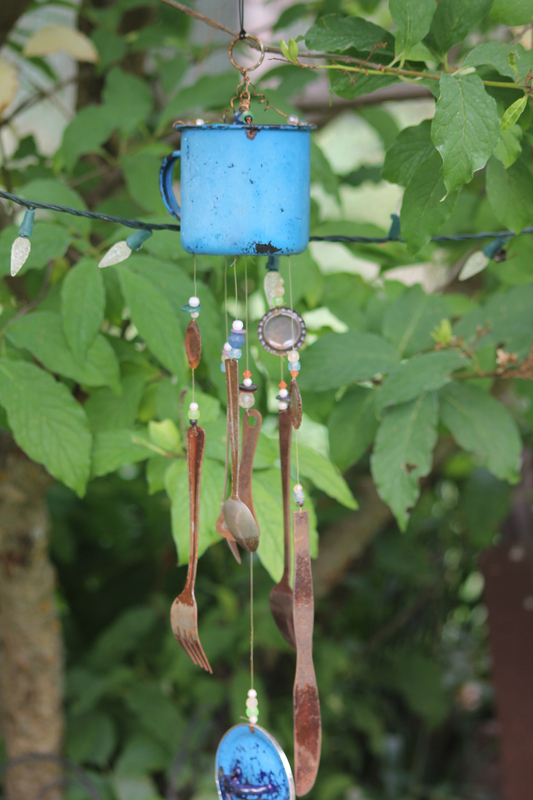 Will go perfect in the kitchen window to keep birds from flying into it. 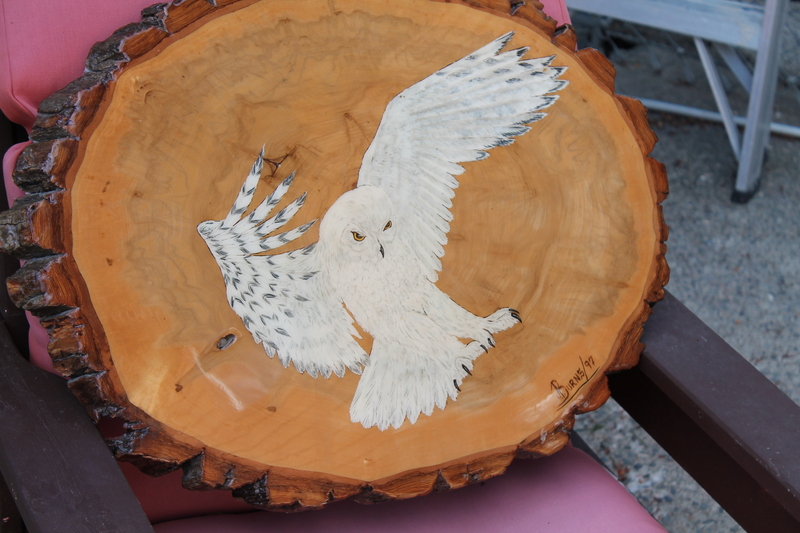 An upcycled piece, perfect to hang in a tree. AND the best boho find ever! 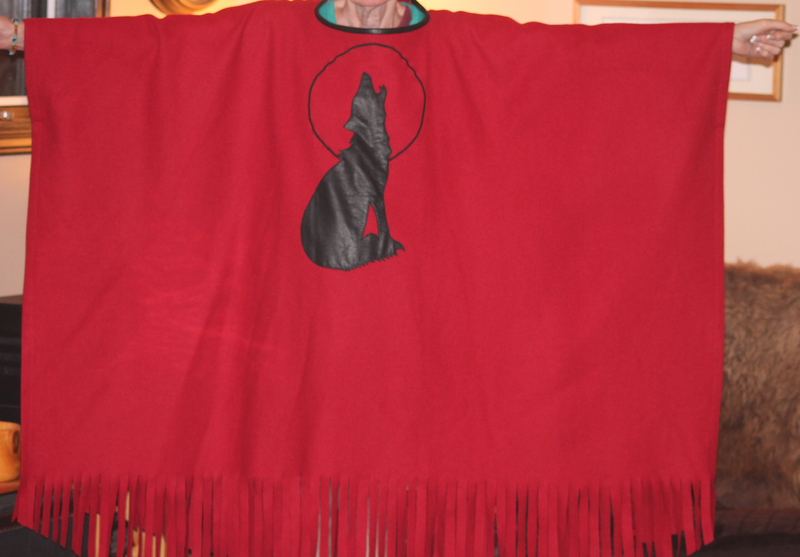 It’s a poncho, Pendleton fabric (wool), with a howling wolf in leather. 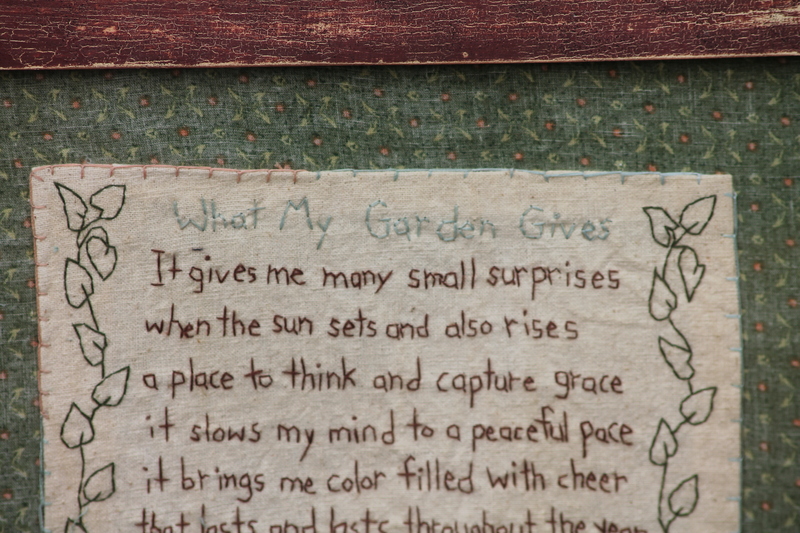 It will make an awesome wall hanging, a go to meeting blanket or just sitting by the fire-pit. 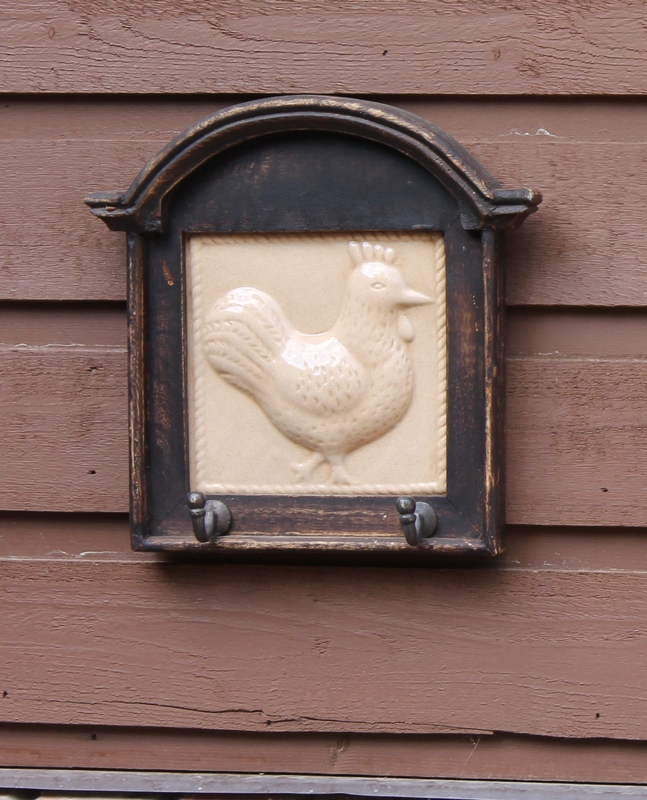 We finished painting the potting shed door. Everyone got to pick a bird so we have a parrot, a canary, an owl and “robin in the rain” to live in the garden of recycled flowers. Of course “Mr. sun has to shine down. I have always loved murals in public spaces. Our town has some spectacular art work in our downtown alleys. It counters the “broken window theory” and makes a trip down an alley a wonderful experience. My barn door is small and inconspicuous. I thought it would be fun to try to mural it. I framed it to paint last year. This is the finished product. 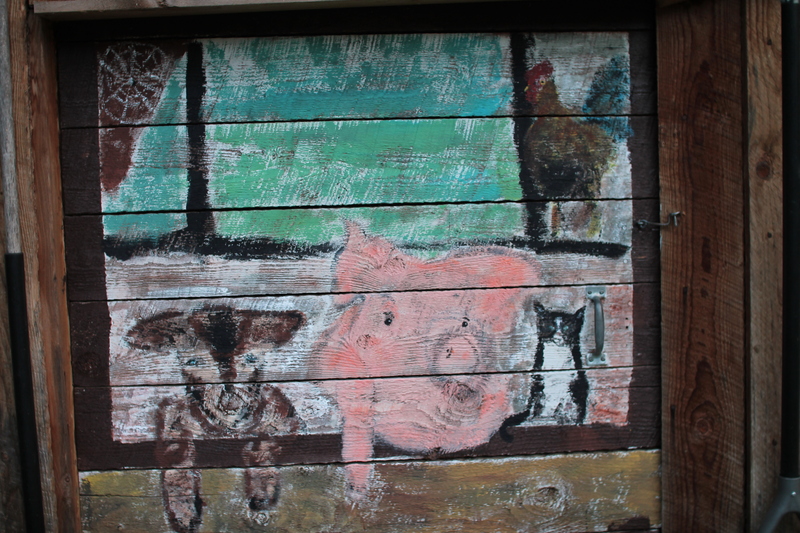 It was difficult painting the rough barn board. I painted Sophie our one and only pig, Mocha one of our Nigerian Dwarf goats; she actually posed for me, Satchmo our last rooster, and Sparkle our oldest cat as a kitten. You can’t have a barn with a pig without a spider so it your loo closely you will see Charlotte. 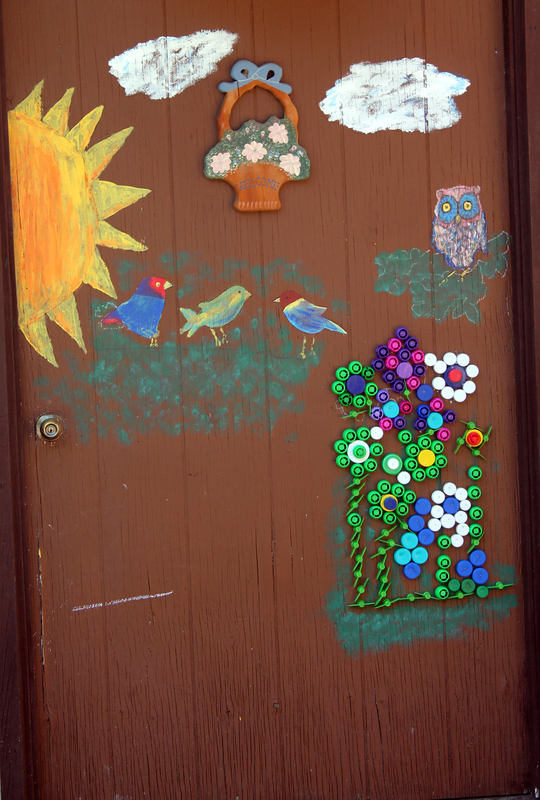 I also decided to “graffiti” my potting shed door. 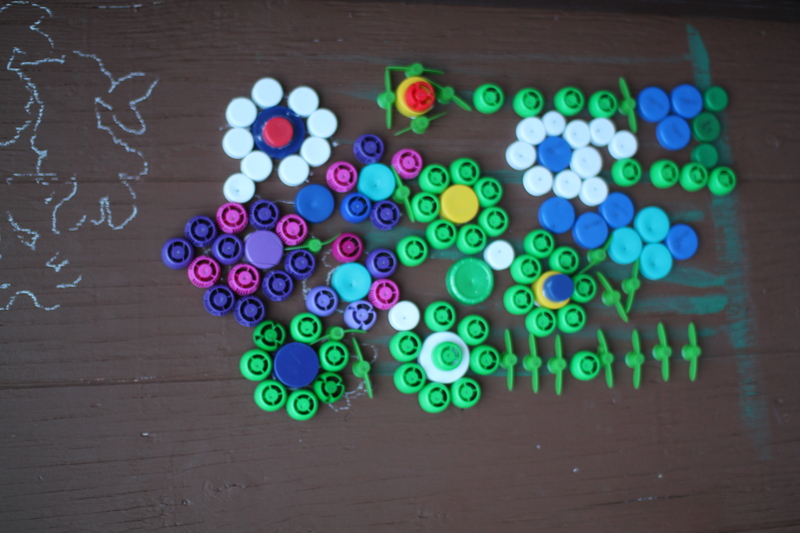 We have been collecting bottle tops from Charlie’s baby food tube things since October when I started babysitting her. I was inspired by people who use this type of plastic for massive art installations; so here is our small one. We still have some work to do on the rest of the door so we will update you later. 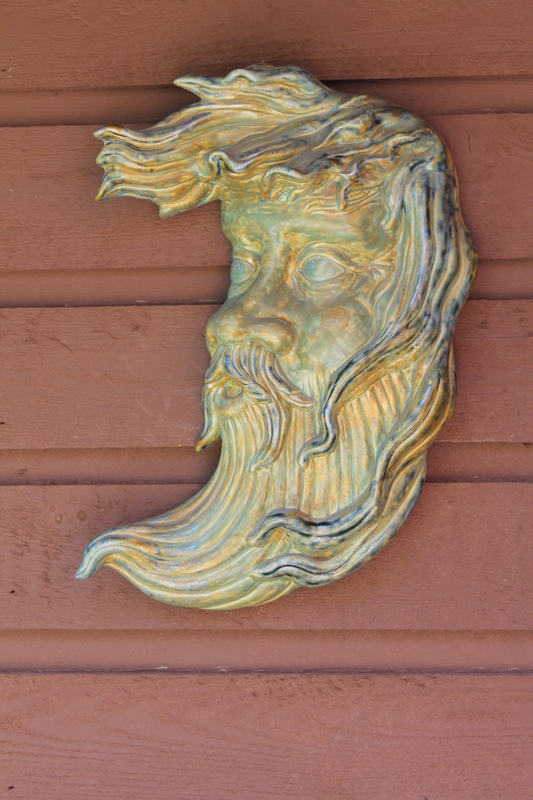 All this art is by what we have in the garden and in the barn. It’s a riot of colour, shapes and forms. The fairy garden continues to grow. The story is that the large fairy on top looks after the whole fairy world. Note she is also in charge of bee hives and hummingbirds. The former empty house is occupied and has a baby lamb. Who knows who else might move in. 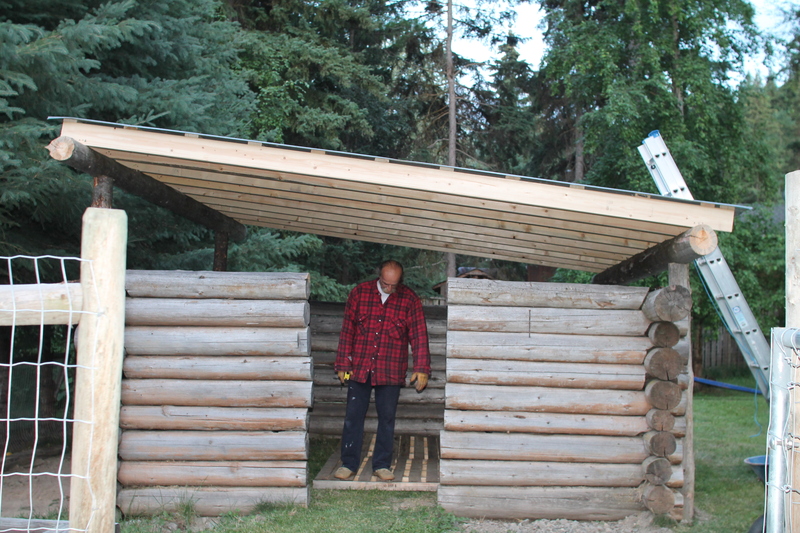 And the log cabin that has sat lonely and unfinished for years, now has a roof. It looks like it would be the right size for a horse? Since I was small I have been enamoured with flea markets. new to you tables. garage sales, second-hand stores and especially second-hand book stores. My first apartment was completely furnished in flea market, 2nd hand, hand me downs. Even the piano was used.